Old map by PIRANESI -Veduta del Sepolcro di Pisone Liciniano su l’antica via Appia...B. Sepolcro della famiglia Cornelia. Title: Veduta del Sepolcro di Pisone Liciniano su l’antica via Appia...B. Sepolcro della famiglia Cornelia. Size: 15.7 x 23.6 inches. Condition: In very good condition. A strong and desirable impression from his most important architectural series. Original etching from the “Vedute di Roma”, which is the name for a collection of 135 monumental etchings by Giovanni Battista Piranesi. With those etchings he had a great influence on classicism and the Empire. 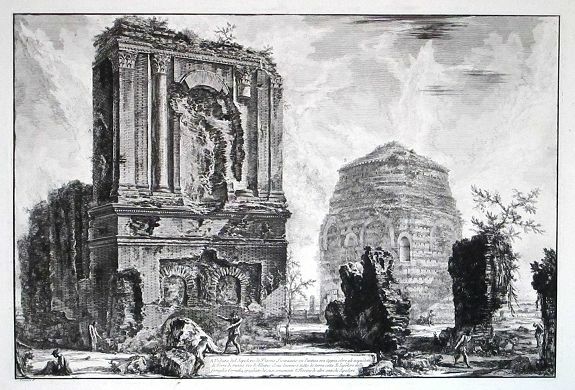 Piranesi, an Italian etcher and architect, first was a student of Matteo Lucchesi and later of the architect Scalfarotto, the engraver Zucchi and the etcher Vasi. Giuseppe Vasi was his first employer. His second employer was Giambattista Tiepolo, THE great Venetian master. In 1745 Piranesi really settled down in Rome. 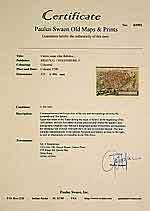 With the series "Antichità Romane" and the etchings "Vedute di Roma" he scored a big hit, also because in that time many Northern-Europeans came to Rome for a so-called "grand tour" during their studies.